Why do some anglers seem to consistently more big striped bass the rest of the pack every spring? Are they lucky, do they have secret spots, or are they pathological liars? My fist first inclination would be the latter, but there are ways to catch more and bigger fish. Here are some striper fishing tips that can help you out-fish the guy next to you! This first set of striper fishing tips is pretty basic, each subsequent post will get more involved. When the water is very cold stripers will not work very hard to chase down a live bunker (menhaden/pogy). A striped bass may chase it for a few moments, but will often lose interest quickly. 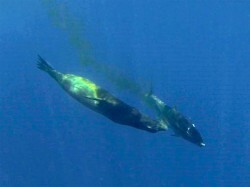 However, having a live bunker or two swimming around the boat is still effective for attracting on holding fish. The best bait will typically be a cut-bait that the striper can easily inhale. It can be hard to obtain fresh bunker in the spring and you may need to resort to frozen bunker. Not all frozen bunker is equal. You can judge the quality by the appearance and definitely by the smell. Poorly frozen stale bunker is certainly less effective. However, carefully frozen bunker can be almost as effective as fresh bunker provided you change it often. It loses the scent very quickly and may only be effective by 15 minutes or so. Check out our detailed instructions on brining bait. The cooler water means softer and more tentative bites. The stripers may be hungry from a winter with very little food, but their digestion has slowed because of the cold water. They just can’t eat a lot and seem to be looking for the prefect meal. 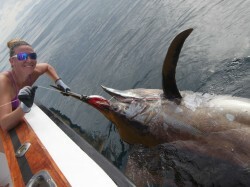 If the angler is holding the rod, the reel should be out of gear with the clicker off. The angler should only use enough thumb pressure to prevent a backlash. 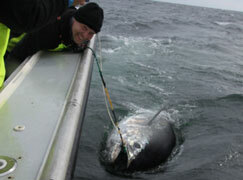 If the rod is in a rod holder or at less of an angle laying flat on the gunwale (preferred), the clicker should be used. When fishing with the rod in the rod holder or laid on the gunwale, it is critical the clicker is turned off as soon as the fish picks up the bait. 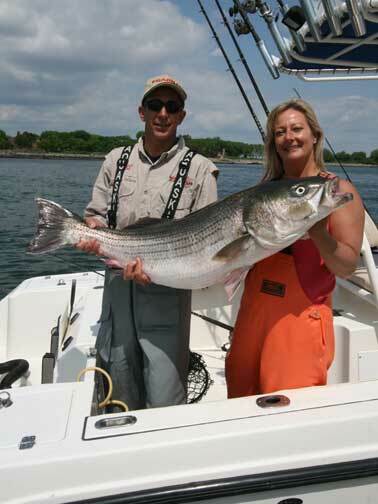 Big striped bass will often drop the bait if they feel any resistance from the rod. Someone should be watching the rod tip. The pick-up will be visible well before the line starts to peel out of the reel. Assuming that everything else went well and the line is peeling out of the angler’s reel, after a few seconds it is time to put the reel in gear and set the hook. Most novice anglers fail miserably at this. They engage the reel, take a swing, and…nothing. All they did was pull some slack out of the line. 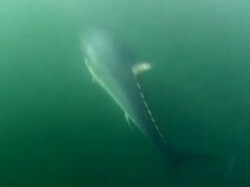 It is critical that the angler reels until the line gets tight before taking a swing. The angler should hold the rod at the top and take a moment to admire the bend. Now the east part, bring the fish to the boat, take a picture, and send it on it’s way! This is the first in a series of striper fishing tips for trophy striped bass. Check out the next striper fishing tips article. Subscribe to our newsletter or like our Facebook page (below) to receive notifications when new articles are published.